The Haier HVTM06ABS has been discontinued. Please visit our review of model HVTEC06ABS to see the current production model. For couples, corporate executives, small business entrepreneurs or, in other words, those who consume wine in limited quantity, but conscious about the ‘correctness’ of wine health and not the people craving for wine preservation, Haier 6 bottle wine cooler can be an economic and brilliant solution to meet their drinking need. With an extended temperature range of 45 to 65° F, this ‘master’ wine cellar from Haier house, NY, USA facilitates you to preserve, protect and get pleasure from your favorite wines. The product is equipped with two solid finished chrome plated storage systems where you can store your bottles 3 each on both shelves. As the blue LED shines inside your chiller unit, it makes a different appeal in the room where, you keep it. Due to its tiny stylish look, numbers of people keep it on the countertop of their kitchen or, even at the bedroom. The digital touch control makes it a trouble-free job for you to restore the unit at the temperature level that you want. 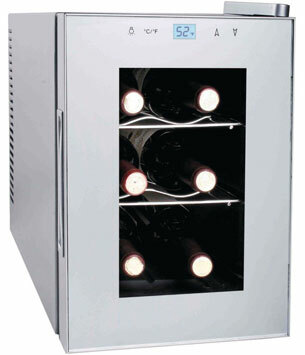 Once you open the cooler’s door to store or take out wine bottle, just keep your eyes on the temperature panel. You will see that for a few seconds, till you keep the door open, the inner warmth scale goes up one or two degrees, and as you close the door the temperature level comes back to its earlier point. Though the shelves are meant for storing standard wine bottles, you can also put bigger shaped bottles, such as champagne, effortlessly. 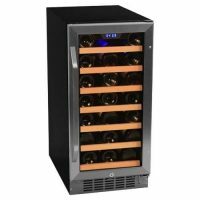 The chiller offers sufficient clearance enabling you to store your re-corked bottles inside. The digital control unit is an exclusive facet of this Haier 6 bottle wine cellar. From the digital display, while you can easily assess the coldness inside, it is also possible for you to bring change in the temperature scale just by finger touch. Outfitted with an extensive warmth range, the wine cooler provides you optimum satisfaction of drinking. According to many customers, the cooler’s width is not suitable enough because you can’t store 2 pear shaped wine bottles side by side. However, this issue can be solved easily, if you store them on upper and lower shelf as one each. Regarding the humming sound of the chiller, there is mixed reactions or reports from customers. While, many people complaint that the cooler operates loudly, which is rather disturbing, numbers of users pass ‘absolutely noise-free’ comments for their units. The majority says that that the humming sound it has is identical to a desktop PC. 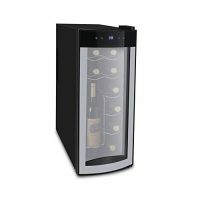 Due to its unique features like compactness, extended temperature range and smart look, the small wine consumers have started choosing this trendy wine cooler unit.